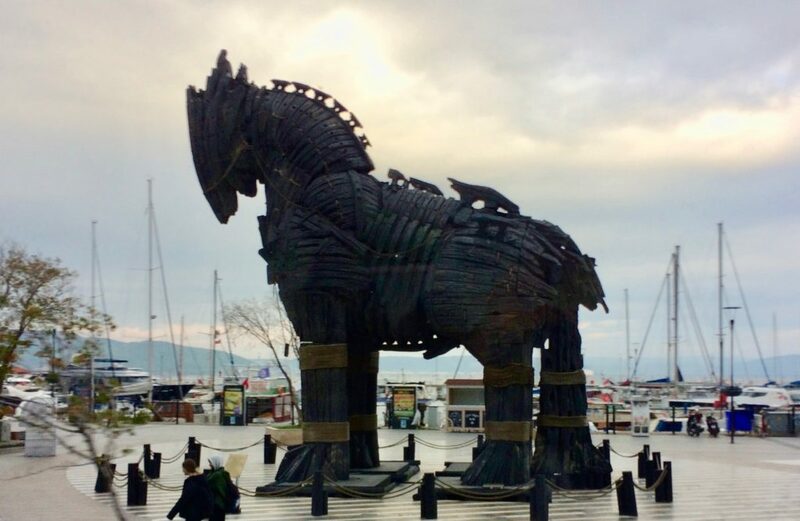 A massive Trojan horse stands by the wharf in Çanakkale, Turkey, where the ferry boats dock after leaving the peninsula of Gallipoli. We could see the horse grow in size as we approached, having crossed the Dardanelles, a narrow strait connecting the Aegean Sea to the Sea of Marmara, a water access extending through the Bosporus and up to the Black Sea. Designed to look like it was built from departing Greek ships, the gigantic horse dominates the shoreline. 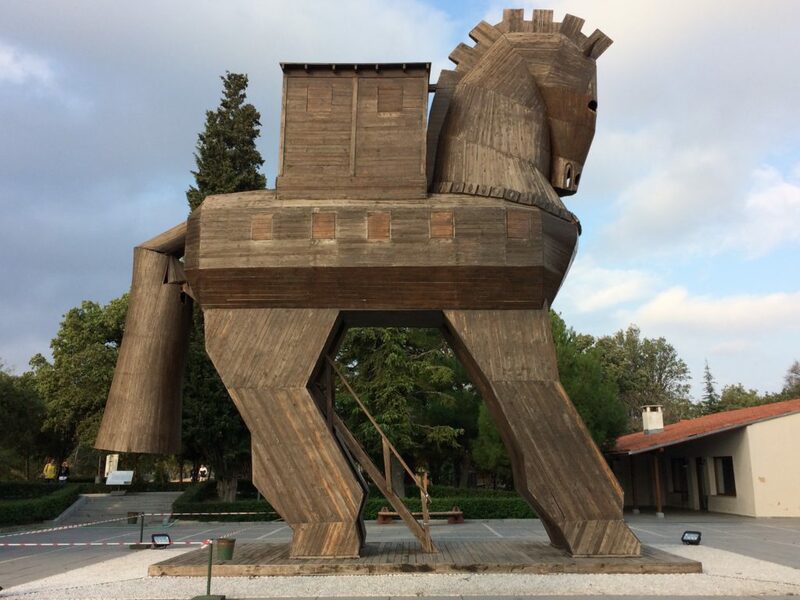 When the cast finished filming The Hollywood movie, Troy (2004), on the Mediterranean island of Malta and environs, the rugged wooden horse was given to the largest present-day town near the ancient site of Troy–Çanakkale. 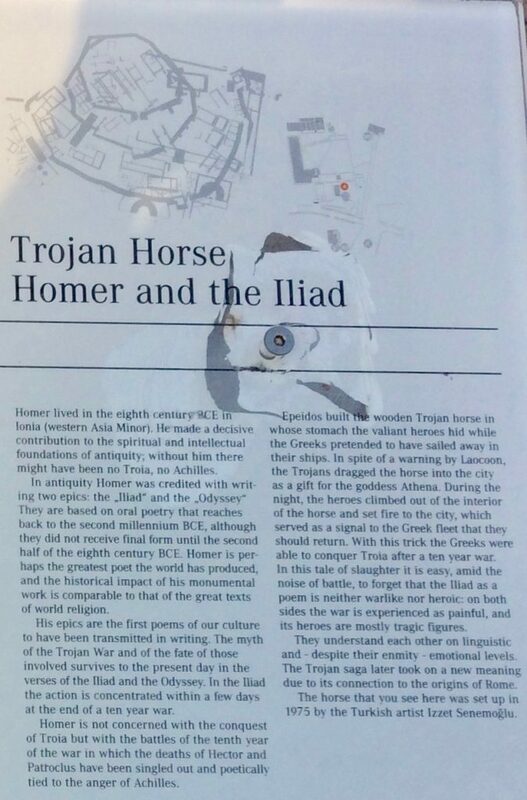 Formerly, Homer’s Iliad was the second most frequently read book after the Bible. Nowadays, however, the classics are taught more rarely, so the tale may not be familiar to a visitor. Perhaps you’ve heard the phrase, “Beware of Greeks bearing gifts,” meaning that some gifts can destroy you. Or the term, “Trojan horse” to describe an apparently benign entity with something dangerous hidden within. If you don’t know the story, you might try this site for a synopsis. The Trojan War seems like such a waste. All those men killed and survivors who had sacrificed ten years of their lives on the attempt to forcibly return the Greek king’s wife from her Trojan abductors. Helen — “The face that launched a thousand ships.” I recognize there is such a thing as national honor. Still, life is short, and death was likely for the participants. Perhaps adventure was the real draw. A good way to prepare for a visit to Troy is to view some of the video lectures on the Internet. I chose Great Tours: Greece and Turkey from Athens to Istanbul from The Great Courses series on classical history and was very glad I did. The viewer is introduced to the excavations at Troy by an overview that identifies the various levels of the tell over time. On-site visuals help to sort the mistakes made by the German entrepreneur, Schliemann, who knew very little about archaeology and dug a big wide trench down to the very bottom of all the layers of the city (1871). He was looking for King Priam’s treasure and assumed it would be in the lowest tell. It wasn’t. 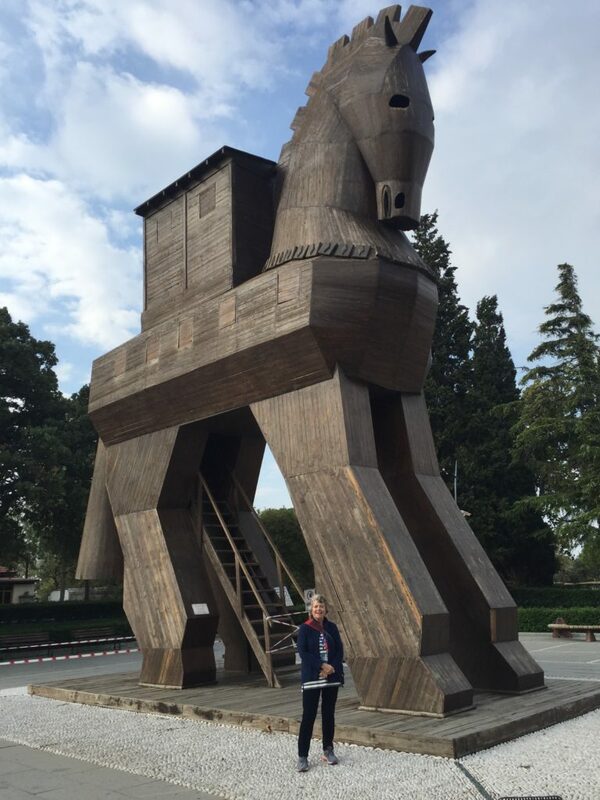 When we arrived at the site of ancient Troy, aka Ilion, Ilius, or Ilium, the entrance to the site held another huge Trojan horse made of wood. This one looked even less likely to be real than the one from the movie set, probably because of the windows along its sides. Tourists can climb up a ladder to the inside and peer out the windows at their friends. We visited on the shoulder season, so the ladder was roped off and the windows were closed. I know it’s silly, but it would have been amusing to peer out at such a height. I question whether the actual horse the Greeks built would have been on such a colossal scale. They had to drag the heavy thing up to the gates of Troy before they feigned departure in their boats. After all, they weren’t trying to hide the entire army inside. 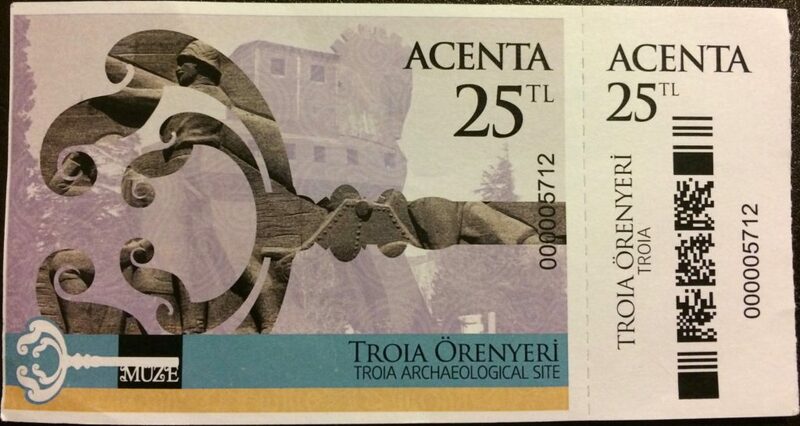 The ruse was simply to hide several men inside who could open the gates of the city at night and let the Greek army in to do the real job of destroying Troy. 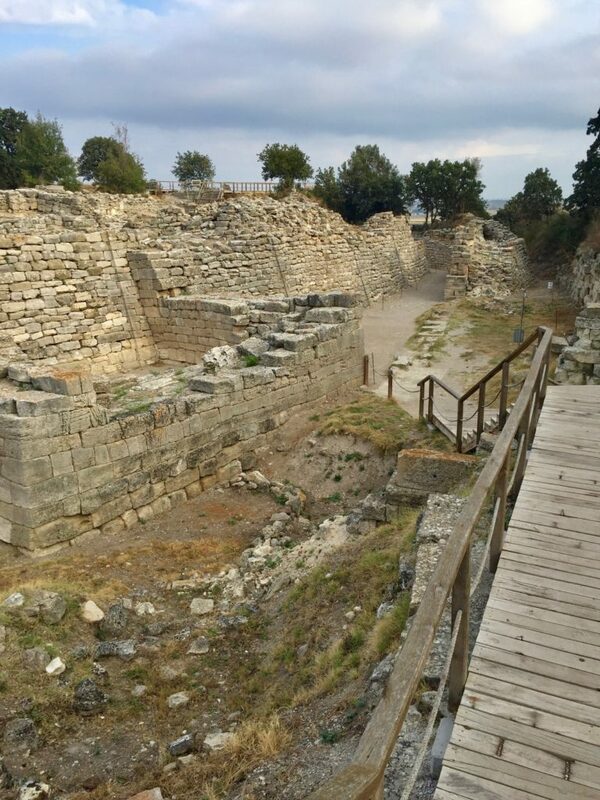 The excavations at Troy are far from over, but a wooden pathway has been built through it so that visitors can walk above the various layers of the ancient city without destroying them. I was particularly pleased with the signage all along the path that helps non-specialists understand what they are seeing. 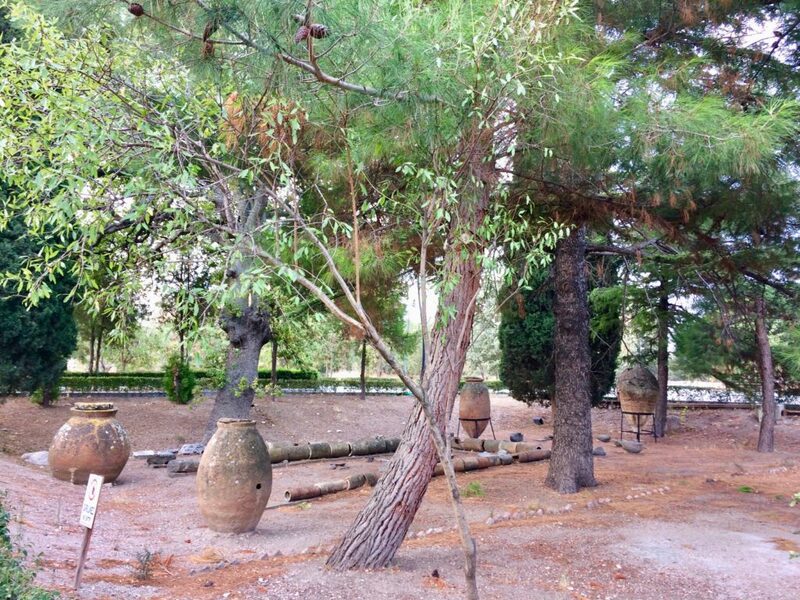 For example, one of the first sights we passed was this wooden area with huge earthenware pots. The signage throughout the site was helpful. When exploring an abandoned ancient site the visitor naturally wonders what happened. Why did people settle there in the first place? Why did the city fall into ruins millennia later? The same vista explained the answer to the second question, why Troy was abandoned. 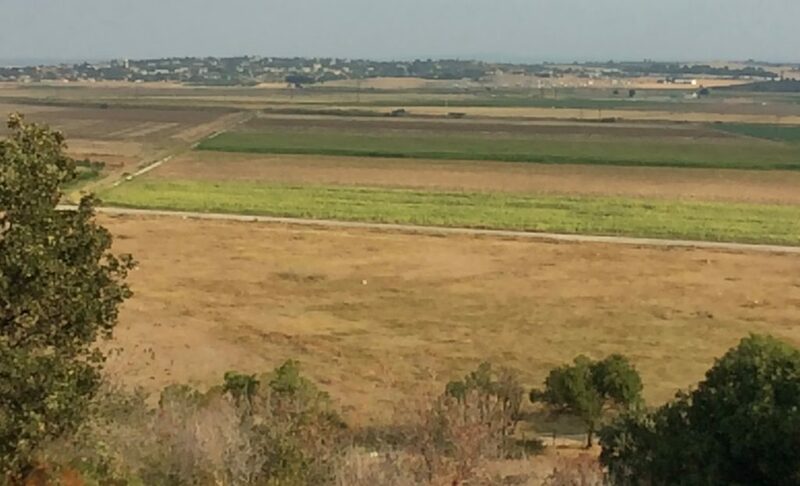 Over time the river waters that fed into the bay completely silted up the bay, thus creating the agricultural area we viewed, but destroying Troy’s access to the sea. Without shipping, the life line of ancient Troy’s commerce died.